Ryan Avila shares a couple of clever ideas for 'repurposing' junk into beautiful household furniture and saving yourself some money as well. Some of the best decorative pieces are the ones you make yourself from supplies you already have lying around. You'd be amazed at the possibilities for all the 'junk' that's built up in your garage. Once you open your mind and get the wheels turning, you'll notice you start to view items with a more creative eye. It's a way of thinking – training your brain to repurpose items is both liberating and satisfying. Browse through our list of five trash revival projects, and gather inspiration for turning your junk into a masterpiece. If you happen to have an old door or find one lying around a thrift store, you can easily make your own headboard. All you need is some paint and a piece of crown molding cut to the same length. Start by sanding the door and removing any imperfections. Use a nail gun and wood glue to attach the molding to the door. 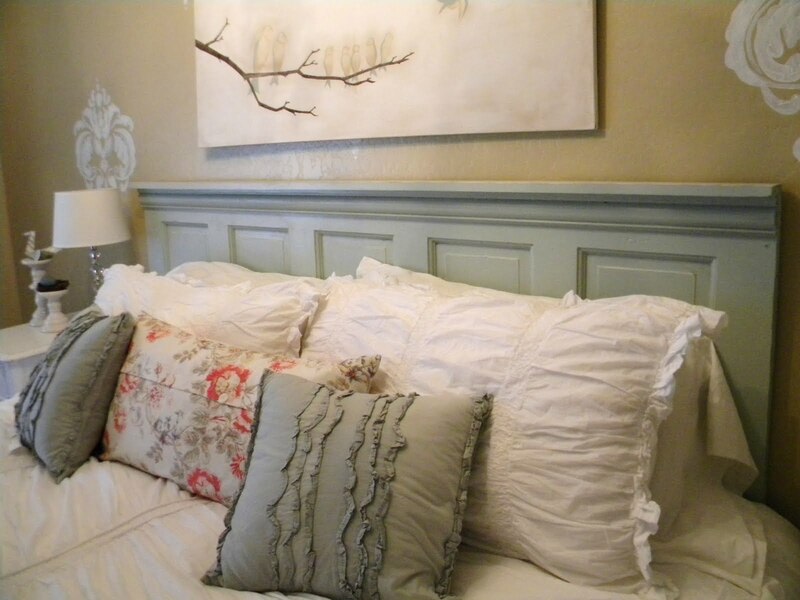 Next, prime the headboard if desired, paint it your color of choice, and you’re done! You may not need that worn-out chest of drawers anymore, but what about a makeshift utility cart for your kitchen? If your kitchen is short on space, this little island can be a lifesaver. It can provide additional storage, extra counter space, and clear up your countertops by holding utensils and paper towels. Make sure your dresser is the right dimensions for your kitchen and then you can get to work! Begin by deciding what color you’d like your cart to be. White is great for making a space look bigger, but a bold color like yellow or blue can be a great pop of color in an otherwise dull kitchen. You can also replace the drawer knobs to create a personalized, high-end look. After you’ve completed the painting, screw hooks into the side to hang your utensils from. A wooden paper towel rack can be attached using a nail gun, or you can choose to install a metal rod. You can even cut a piece of stone the same dimensions as the top of the dresser, and use the surface as a cutting board. When you begin to look at things with an eye for repurposing, you’ll see the possibilities are endless. There is so much potential for reinventing an item you already have into something new and beautiful (saving yourself a lot of money!). Take a walk through your garage and storage room, and survey what unused items you have just lying around. As they say, 'one man’s trash is another man’s treasure' – so if you don’t find something in your own garage, check with your friends or head over to your local thrift store. By Ryan Avila – Content writer for US Alarm. Tony Wrench shares his many years of experience, plus photos and drawings of his roundhouse, that has cost just £5,500. Updated to 2014. Maddy tests out a small Hobo stove attachment that works with or without a Kelly Kettle base.